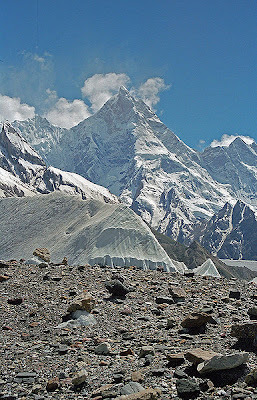 The policy of the Great Trigonometric Survey was to use local names for mountains wherever possible and K1 was found to be known locally as Masherbrum. K2, however, appeared not to have acquired a local name, possibly due to its remoteness. The mountain is not visible from Askole, the last village to the south, or from the nearest habitation to the north, and is only fleetingly glimpsed from the end of the Baltoro Glacier, beyond which few local people would have ventured. The name Chogori, derived from two Balti words, chhogo ("big") and ri ("mountain") has been suggested as a local name, but evidence for its widespread use is scant. It may have been a compound name invented by Western explorers or simply a bemused reply to the question "What's that called?" It does, however, form the basis for the name Qogir by which Chinese authorities officially refer to the peak. Other local names have been suggested including Lamba Pahar ("Tall Mountain" in Urdu) and Dapsang, but are not widely used.